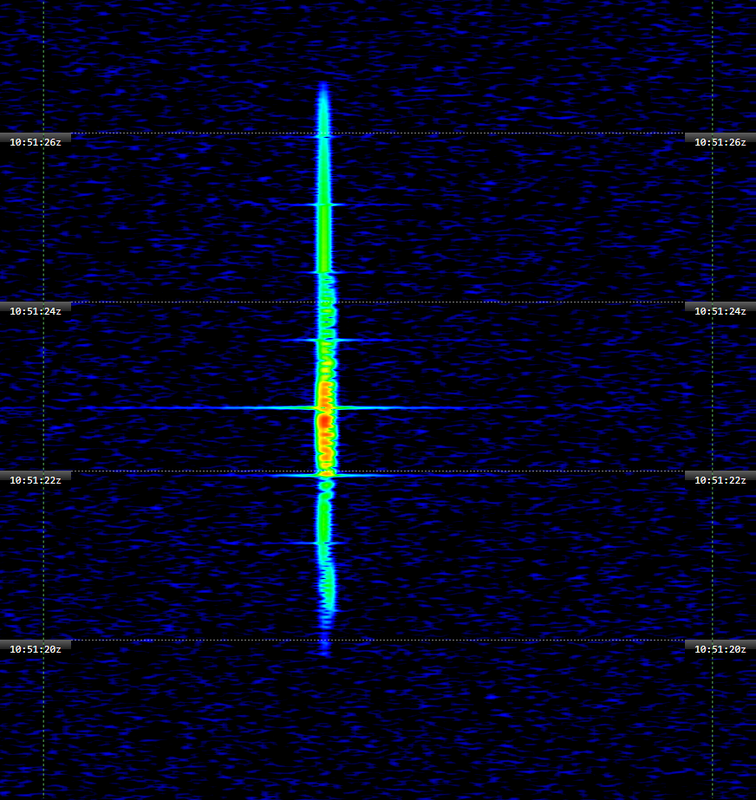 Offset-DXing “on the fly” shows four different stations (spectrogram) on one nominal channel, namely 801 kHz. The window is baout 30 Hz wide and shows the carrier on HF level. Although I use Simon Brown’s excellent software SDR Console V3 for years, I only now discovered a feature, being most valuable for medium wave DX. Nearly each medium wave channel is populated by a couple of stations which mostly have a slight difference from each other, called offset. This often is specific to specific stations. It even reveals stations too weak to be heard. Software V3 will show these carriers of HF level during normal listening, being live or from an HF recording. Read MW-Notes, to get some information on “how-to” on 6 pages, with 12 screenshots. There you will find also a hint for a method with even much more resolution (but: not “on the fly”) plus some information on how to measure signal strength and estimate/calculate the SNR of speech/music, rather than that of just the carrier. You have to distinguish between absolute and relative frequency accuracy; the first is best achieved with a GPS-disciplined oscillator, the letter the normal case. P.S. I started with these things back in 1997 with an evaluation board from Motorola, followed by sound card & software on audio level (“Soundtechnology zeigt Signale: Sieh’, wie es klingt!”, funk magazine 6/1998), to be continued on HF level from 2006, first with RFSpace’s groundbreaking SDR-14. Three years later, I published a survey of each and every 9- and 10-kHz-channel on medium wave by this method. After Apple closed their web service, these pages had gone astray, and the information is now not up-to-date anymore. State-of-the-Art now is the method described in the paper. Undoubtly, a Graves is a fine French wine from the Bordeaux region in western France. So it is so surprise that also GRAVES is an extraordinary Radar station. It was built to detect and follow satellites and their debris. They sequentially cover from 90° to 270° azimut in five big sectors A to D, and change from sector to sector each 19,2 seconds. Each of this sector is further divided into 6 segments of 7,5° width, covered for 3,2 seconds each. They are transmitting on 143,050 MHz. 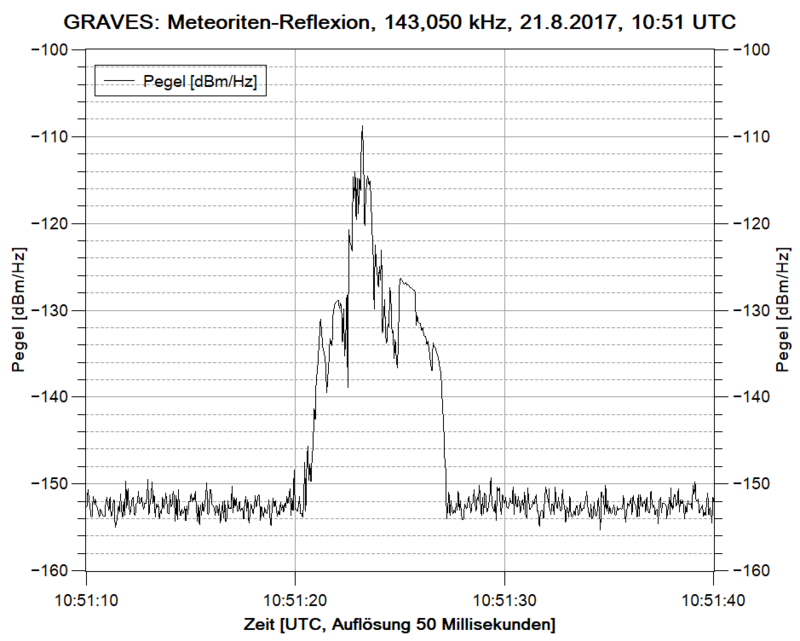 If you are in Europe and tune into 143.049,0 kHz USB, you probably will hear/see some reflections of meteors, airplanes and even spacecraft. The distance between the transmitter and my location is about 630 km, and for their southly directed transmissions, there most of the time is no direct reception. 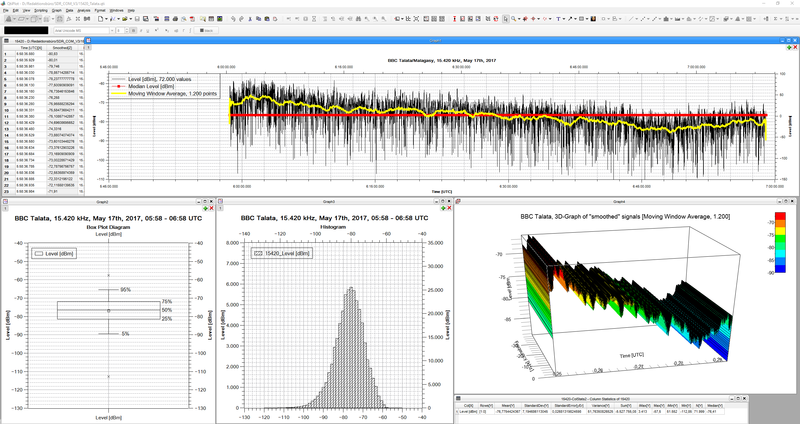 A level diagram of the meteor trail reflection from the spectrogram at the top, visualized qith QtiPlot. From this audio, in turn, you may do an audio spectrogram, possibly revealing further details of e.g. of the trilling sound like that from a ricocheting bullet: The Searchers (the 1956’er Western film by John Ford, not the British boy group from 1960 …) on VHF. Audio spectrogram of the sound, revealing “packets” of sound which result in the trilling audio. At start, these packet show a width of about 42 milliseconds to be reduced to 37 milliseconds. Den Stand der Dinge habe ich nach öffentlich zugänglichen Informationen in der Juli-Ausgabe der Fachzeitschrift “Funktelegramm” zusammengefasst. DARC-Noch-Mitglied DL7AG hat diesen Text mit Erlaubnis von Joachim Kraft, Herausgeber und Chefredakteur des “Funktelegramm”, auf seine Website gestellt. Wie inzwischen weiter bekannt wurde, hat allein das DARC-Mitglied des Entwickler-Duos, Helmut Goebkes, für das Projekt 25.382,70 Euro erhalten. Der Auftrag wurde ihm freihändig und ohne Ausschreibung vom DARC-Vorstand zugeschoben. Der Software-Entwickler Stefan Görg – kein DARC-Mitglied – ging hingegen leer aus. Er hatte auch niemals Geld verlangt. Überdies nehmen die Ungereimtheiten innerhalb des DARC darüber zu, wer dieses Netz eines Tages überhaupt wird benutzen dürfen: nur DARC-Mitglieder oder jeder Funkamateur? Der DARC-Vorstand möchte es exklusiv seinen zahlenden Mitgliedern zur Verfügung stellen – wobei der Zutritt zum Verein nicht diskriminierungsfrei ist. Viele andere Funkamateure – darunter sogar Betreiber des Netzes! – teilen jedoch diese restriktive Sicht des DARC-Vorstandes nicht und setzen sich für einen wahren Ham Spirit ein: „Die Ausbreitungsbedingungen sowie die eigene Aussendung können mit der neuen Technologie von Funkamateuren aus der ganzen Welt beobachtet werden. Die intensive, ja wissenschaftliche Auseinandersetzung mit einem großen Frequenzspektrum ist damit jedermann möglich“, heißt es etwa von den Betreibern aus Bad Honnef, die sich im Gegensatz zu ihrem Vereinsvorstand ein für alle Funkamateure weltweit offenes System wünschen. Beispielsweise erfordert es eine Klärung der amateurfunk-genehmlichen Rechtslage, die der DARC auch im vierten Projektjahr immer noch nicht erreichen konnte. Der erhoffte sich übrigens für seinen Verlagsableger ein Geschäft mit der Hardware und warb mit großer Tröte dafür, dass die Transceiver über die DARC GmbH beziehbar sein werden. Auch das hat sich trotz vollmundiger Ankündigungen noch nicht materialisiert. Haken soll die Inbetriebnahme des Transceiver-Netzes zudem noch daran, so DARC-Mann Goebkes, dass “entsprechende sendefähige Breitbandantennen (!) am Aufstellort vorhanden sein” müssten. Aber nur schwer vorstellbar, dass dem nach einer langen Bewerbungsphase für die 15, 18 oder 19 Standorte nicht ist. Denn, so der DARC, diese mussten sich ja in einem Bewerbungsverfahren unter den mehr als 1.000 Ortsvereinen “durchsetzen”. Und selbstverständlich wird eine der Bedingungen für den ersehnten Zuschlag gewesen sein, für die entsprechende Infrastruktur zu sorgen – wie sie im übrigen schon an vielen Standorten vorhanden ist. SDR Console V3: Signal History and six RX Panes! NEW: The Receivers’ Pane on top covers spectrum and spectrogram of up to six demodulators – look at different modes and bandwidths. Also new: “Signal History” at the bottom. “Signal History” takes the signal strength of the given bandwidth each 50 milliseconds, which can be saved in a CSV file. It is also shown in three different speeds on a display. “Receivers’ Pane” shows up to six combos of spectrum/spectrogram of the complete up to 24 parallel demodulators (they additionally can be shown in the Matrix, as in former versions). See screenshot on at the top. With some statistics applied on the CSV file of Signal History, you’ll get a deep inisght into fading structures. Top: original data (black), averaged (yellow), median (read line). Bottom: box diagram, histogram, 3D-band. See following screenshots for some examples. It’s pure fun to listen to N-Joy, a North-German broadcaster, in DAB+. This digital mode should replace all classical FM broadcast, and has already done this in some countries where others offer both – like Germany. Footprint of DAB+ broadcasts in Germany. Pin = my location. In the list you see the stations plus the channel (“bouquet”), here 5C omnidirectional from Hannover with 10 kW and 6C, also from Hannover, but pointed to the east, with 8 kW. As AirSpy is covering also these frequencies with high sensitivity and a decent dynamic range, I gave it a try. First software used is called Welle (English: wave) by a team around Albrecht Lohofener. I use it on a PC/W10. It’s easy to install, and then start it by the usual double-click. An MS-DOS windows opens, starting a routine for searching and opening the AirsSpy connected to your PC. This window informs you on all steps the software is doing. The scan is running, 13 stations have been found so far. With expert mode (“Expertenmodus”) activated, you see the spectrum of the frequncy set being scanned. From the spectrum (right), you might see if HF gain ius ok, or that you should go from automatic (“Auto HF-Verstärkung”) to manual gain control (“Manuelle Versätrkung”) to either imporve sensitivity or to avoid distortion due to strong transmitters nearby. With me, “Auto” drives fine. Just click your station from the list on the left, and the station will be heard. Many of them provice additonal information, as here MDR Sputnik with weather. On the right you again see the spectrum of the whole bouquet (6B, 183,648 MHz) plus additional information an the quality. Secondly, a more technical approach is offered by Jan van Katwijk with also free Qt-DAB. I also use it on my PC/W10. After downloading the suite, containing also other intersting software, just start “qt-dab-0.999”. An MS-DOS windows opens, followed after some seconds by the GUI. Here you have to define the receiver from a drop-down list, choose the boquet (5C, in this case), and scanning serves you the stations’ list. You may have up to five different windows open – from the MS-DOS window to more detailed technical data, including a QPSK phase window, right from the spectrum. Thanks to both, Albrecht and Jan, to have developed this fine piece to software, free of charge! If you still desparately looking for a software to restore your recorded DX audio clips, iZotope’s RX6 offers an alomost perfect solution. While the de-crackling tool automatically removes all of these annoying statics, the near-unbelievable tool “Spectral de-noise” is doing wonders in extracting e.g. formants of speech out of noise, thus greatly enhancing intelligibility. Sounds quite artifical – but drop your ear onto the last part, how clean the jingle sounds! To restore audio of DX MP3 clips, is not where this software is really adressed to. But even for this purpose, it’s strong algorithms perform better than any other device/software, I’ve seen in the last 50 years. And there are a lot more functions to tweak a signal further. Not really cheap, but unique. There’s simply nothing better! Wo eigentlich bleiben die Weltempfänger? Die Spitzenklasse kommt heute nicht aus Japan und schon gar nicht mehr aus den USA oder aus Fürth, sondern aus: Dessau. Dort hat Burkhard Reuter unter anderem seinen Pocket entwickelt. Das ist ein Taschenempfänger, den es auch mit Sendeteil gibt. Seine Leistung ist absolute Spitzenklasse. Sein Konzept folgt einem ab initio selbst entwickelten und “Spectrum Based Signal Processing” genannten Algorithmus. Alles an diesem Gerät ist schlichtweg außergewöhnlich: von der Leistung über die Wertigkeit bis zum Preis. Für die Titelgeschichte der Mai-Ausgabe 2017 der Fachzeitschrift FUNKAMATEUR habe ich Burkhard Reuter in seiner Werkstatt besucht, mir seinen Weg und sein Konzept erläutern lassen sowie seinen Receiver auf Herz und Nieren getestet.